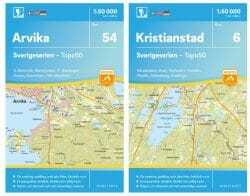 Lantmäteriet (National Land Survey of Sweden) and Nordstedts have revamped their 1:50,000 range of Topographic maps of Sweden this month, replacing the Terrangkartan series with the new ‘Sverigeserien’ (Sweden Series). These are very similar to the Nordeca ‘Norgeserien’ (Norway Series) maps and are clearly designed for outdoor use having a similar cardboard cover around a water and tear resistant map printed on Polyart. The maps can be folded repeatedly without breaking or tearing which makes them idea for frequent use in both winter and summer. Each map covers a larger area than the old Terrangkartan maps (45x68km) and this means that the number of maps has been reduced from around 250 to 116 while still covering southern and central Sweden and the northern coastline. Designed with outdoor uses in mind, contours are marked at 5m intervals and topography is easily and clearly marked with terrain information, hiking trails, illuminated tracks, camping, shelters, golf courses, leisure baths, historical remains, roads in different categories, railway lines and much more. They have also been designed with tourism in mind because the legends are in Swedish, English and German.